As anthrax powder arrived at different places on the United States East Coast, via regular mail, the entire postal system was closed down for a time. The events of nine eleven were a terrible shock to all in the United States, yet from many points of view that should not have been the case. The litany of mayhem, all of it directed toward removing U.S. influence in the Middle East, includes the truck bombing of a military base in Lebanon in 1983, killing 241 U.S. servicemen. A similar truck-bomb killed nineteen U.S. servicemen at their base in Saudi Arabia thirteen years later, and in 2000 the Navy Vessel USS Cole was attacked by suicide bombers in the harbor of Yemen, killing seventeen sailors. These assaults on U.S. people and U.S. interests abroad were not limited to installations within Middle East countries. Murderous action was taken against U.S. citizens and American interests anywhere. In August of 1998 the U.S. embassies in Kenya and Tanzania were blasted by car bombs on the same day, killing 230 people, including twelve Americans, and injuring 5,000 others. Damage amounted to $38 million. In several of these events, the United States response was to step back from the areas in which terrorism occurred, exactly the kind of response that the perpetrators of violence hoped for. Is it, therefore, likely that the assaults of nine eleven were based on a similar hope? The long history of terrorism suggests that this may well be the case. While acts of terror date back to the beginning of human history it was in 1795 that the word “terrorism” was first used. It had its roots in the phrase “Reign of Terror,” a term associated with the French Revolution, particularly with regard to the use of the guillotine by the French revolutionaries. Later the word was employed to describe the behavior of states like Nazi Germany and the Soviet Union and it even came to be used by political activists who claimed to be seeking freedom but had sought it by the most barbarous methods imaginable. Much of modern terrorism stems from the Arab–Israeli Six Day War of 1967 when Israel occupied the West Bank and Gaza Strip and members of the Palestine Liberation Organization began to adopt terrorist tactics. They claimed to be freedom fighters and their supporters in other countries adopted similar tactics. Airliners were frequently hijacked and Israeli civilians murdered through bomb attacks. The United States was attacked on more than one occasion because it was seen to be supporting Israel. Since the 1980s, these attacks against the United States have become more and more violent, not now by terrorists fighting for Palestinians, but rather by religious extremists who were determined to force America out of the Middle East. Osama Bin Laden and his associates organized the ultimate terrorist attack in the nine eleven assault. 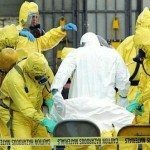 The aftermath of that attack, Anthrax terrorism that arrived in the U.S. a month after nine eleven, was an even more frightening act because it introduced everyone to the potential of chemical terrorism. Anthrax infection is a disease that mainly affects grazing animals like sheep, cattle, and goats. It was known 2,000 years ago, and in the nineteenth century there were vaccines developed to prevent its development. Throughout the twentieth century various governments conducted research on anthrax because of its potential use as a weapon and fortunately it was never used in warfare. An accidental release from a research facility in the former Soviet Union killed seventy people and, in 1993, there was an attempt by a secret society in Japan to release anthrax spores in downtown Tokyo. That was the first time that the dangerous bacillus was directed against a civilian population. The anthrax bacillus is a tiny organism. Hundreds of them if laid end to end would take up less than a millimeter. When exposed to air, anthrax forms spores and these can reproduce in the body of the host that receives them. It is not a contagious disease. Skin anthrax can usually be successfully treated with antibiotics but the danger is far greater if the spores are inhaled. Very few ever survive inhalation unless antibiotic treatment is given within a day or two. In the vast majority of cases the victims are dead within a few weeks. Anthrax is found in soil all over the world in most countries and instances of human infection are frequently reported in Middle Eastern countries and in Africa. During the Gulf War of 1990–91 U.S. soldiers were inoculated with a vaccine to prevent them catching the disease. There was some fear that Iraq might use anthrax as a weapon. In mid-October, a few weeks after the devastation of nine eleven when the World Trade Center towers were destroyed and the Pentagon hit, letters containing anthrax spores began to arrive at various U.S. media centers and government offices in Washington, D.C. A photo editor in a Florida news agency was the first to be affected. He opened an envelope that arrived on October 15 and unknowingly inhaled some of the anthrax that fell out. Several days passed before the contents of the envelope were tested and identified. By then it was too late to do anything for the photo editor. He died two weeks later. Five days after the delivery in Florida the next anthrax envelope arrived. This time it was the office of Senate Leader Tom Daschle. Over the following two weeks several more anthrax letters arrived at both media centers and different offices in Washington. There were also hoax letters that looked like the lethal ones. Most of the attacks occurred between October 15 and 31. Places in at least nine states became involved. As long as each instance only affected the person to whom the letter was addressed there was limited concern since care in handling mail and immediate use of antibiotics could cope with the dangers. Before long, however, it became clear that the trail from sender to recipient could itself be a source of contamination. In Indiana, on October 31, a postal machine sent to Indianapolis had traces of anthrax. At the same time, in Missouri, anthrax spores were discovered in empty mailbags. There developed a general fear that the mail service might be infecting people and places everywhere it operated, both at home and abroad. Confirmation came from new infections in people who did not work in any of the affected places. By the end of October 2001, five people were dead from anthrax, including two postal workers and a journalist, and thirteen others were ill. As a result, much of the postal system as well as several government offices had to be closed down temporarily in order to cope with ways of preventing additional infections. Thirty congressional workers had tested positive with anthrax and the Hart Senate Office Building, the House of Representatives, and even the Library of Congress all had to be evacuated at times because of the presence of anthrax spores. The mail facility in Fairfax, Virginia, which handles all the mail for Washington, was found to be contaminated with anthrax spores. Interim measures were taken in all government offices and in various places across the country. Many school and public libraries were closed. Several affected postal stations were also closed. The White House mail was quarantined and several government offices locked in order to check for spores while their staffs met elsewhere. For the first time in its history, the Supreme Court convened away from its own chambers. The State Department cut off all mail to its 240 embassies and consulates worldwide. One expert in government administration said that nothing since the days of the Civil War had as seriously disrupted the business of government as this anthrax attack. He added that the economic losses would probably amount to billions of dollars. As intense investigations into the source of the scourge continued, the post office began the process of irradiating all mail. At the same time, extensive tests were conducted on the anthrax powder to find out how it was made and what type of powder was used. It was known that identical material had been employed in all the attacks, proving that the campaign originated from a single source and possibly from a single terrorist. Over the following six months it was established that the kind of powder used was quite different from that used by government biological defense programs, in both the United States and other countries. This seemed to confirm FBI suspicions from the beginning that the whole enterprise was a U.S. plan, not the work of terrorists from overseas. Research workers also discovered that the anthrax had been coated with a chemical substance that would prevent the tiny spores from clumping together. Thus they would float freely into the air once a letter was opened and inhalation would be likely. Evidence of these kinds suggested that the person behind the attack was well acquainted with the chemistry and technology of using anthrax as a weapon. Perhaps he may have worked in the U.S. government’s biological defense program at some time and was now a disgruntled person seeking revenge or notoriety. Regarding the latter, he certainly gained the reputation of causing the worst acts of biological terrorism ever known in the U.S. FBI investigations are continuing, seeking data on the genetic signatures that might help them localize the specific site where the anthrax originated. FBI’s earlier conviction that the culprit was a U.S. scientist with special training and skills has been strengthened by all the findings to date but, like so many other acts of terror, the culprits are still at large.